Wear Abouts: INTERNATIONAL Torn To Pieces Giveaway [10 Winners] !! INTERNATIONAL Torn To Pieces Giveaway [10 Winners] !! YOU MUST do AS MANY OF THE ENTRIES AS YOU CAN!!! p.p.s. CONGRATS TO GIOVANNA, THE WINNER OF THE CRYSTAL BRACELET!!!! I love the black leather watch! i loved your outfit! i dont know what i love more, if your skirt or your top... you look amazing! Oh my gosh I fricken LOVE this stuff - these bracelets are more my style than I can even believe. ((Also. I am beyond obsessed with your sandals in this picture. They are the PERFECT leather sandals! So so so jealous). I did all the stuff above, and my fav would have to be the Brown leather cuff with dark brown leather designs, though it was really hard to say just one, because they're all so so so cool. I love how big they are! Statement leather. Such a cute top--haven't been to those stores in awhile..need to check them out!! You know how they say its all in the details? Well this outfit has got it! I just love the lace material for the shkirt and the cool cut out designs on that tank. So pretty! I absolutely adore the back of your top! Great find! SO cute! I love the top with the skirt. And the sandals are fabulous. This is so cute! It's pink! You really did good with matching those sandals with that bracelet! Such awesome leather accessories you own! 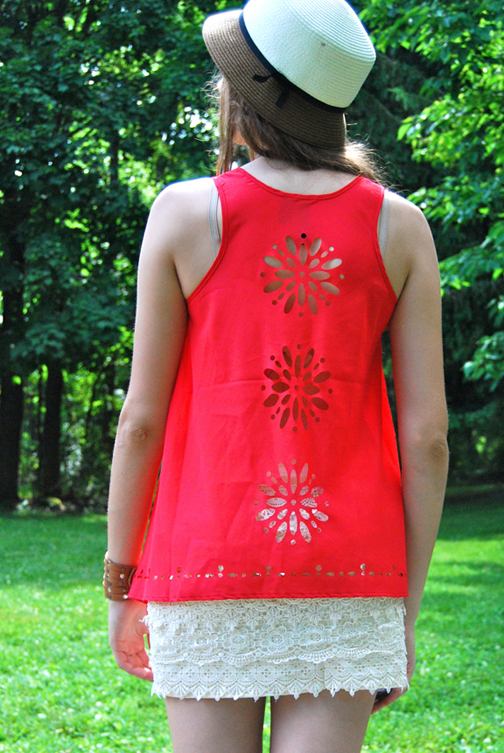 And those lace shorts are some of the cutest I've seen in the blogosphere. I really like your top. It is a great color, and the back is so pretty. Cute summer outfit, I love your sandals! Omgsh...I've thought about that actually...lol maybe I need to give him an alias and just call him P or something...but even then, it'd be obvious. >_< Ah well, hopefully he never discovers it, that'd be embarrassing...lol. I love these: http://www.etsy.com/listing/101887094/mystery-braid-bracelet-friendship I entered your giveaway as many ways as I can but didn't follow on instagram or twitter because I don't have accounts with those sites :( Hope my entries still count! Thanks, Rory! i love the black leather watch! That's my favorite item! I love this look, it's so simple&chic, you look stunning. Your bracelets are great! I like the brown one that you are wearing in the pictures. My favorite item is the Pink leather and grey suede cuff bracelet with pink and purple glass beads cuff bracelet! I love the Brown genuine leather wrap watch bracelet with silver studs! The pink and taupe leather cuff is so pretty and of course the leather studded double wrap cuff bracelet!!! Is so beautiful! I love angels wings! Such a cute look and fun giveaway! I love your top! Such a cute find! 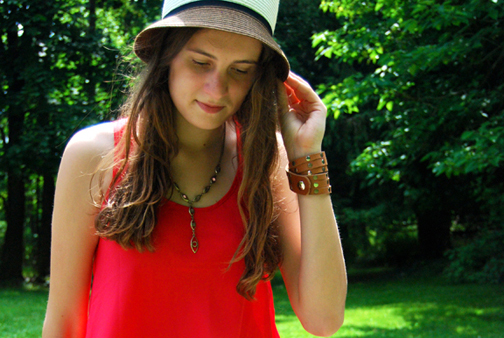 My fave piece is the brown leather cuff bracelet with glass beads! Too cute! I hope I win this giveaway. Please come join mine too, there will be two winners! Bam! Awesome! Thanks for the fabulous giveaway! the "Tan Leather Mystery braid cuff bracelet with cross charm, Tan leather cuff with wire detail, silver cross and bead by torn to pieces"! I really love the pink and taupe leather cuff bracelet! I like the Brown leather cuff bracelet with multi colored glass beads. Love the turquoise leather headpiece! My favorite Torn to Pieces item is Pink Leather and Grey Suede Cuff Bracelet with Pink and purple glass beads. This one black with lace is awesome!